Jeron Teng, Kiefer Ravena, & Daniel Padilla Join Forces for the Hoops for Hope Celebrity Charity Game: When and Where to Buy Tickets? And Other Event Details Here! Jeron Teng, Kiefer Ravena, Daniel Padilla and other college and showbiz basketball stars have joined forces for the Hoops for Hope Celebrity Charity Game for the benefit of World Vision Foundation. 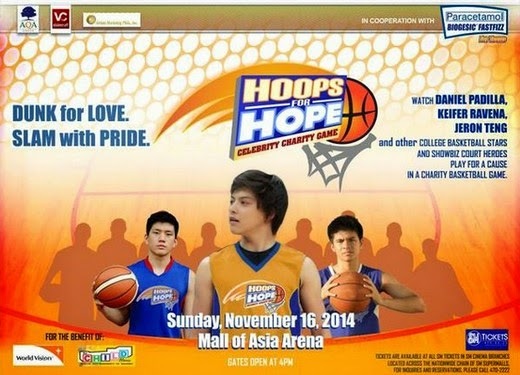 The Charity Game is scheduled to happen on November 16, 2014 (Sunday) at the World Class SM Mall of Asia Arena in Pasay. The tickets to the event are now available at all SM Ticket Outlets. You may also call their hotline number: 470-22-22 for other details.